I've been around the block a few times. A veteran of the "math wars", I've been an elementary teacher since 1989, having taught mathematics in every grade pre-k through six. Through my career, I have been exposed to a wide variety of mathematics pedagogy and curricular materials in both public and private schools. All of this experience is evident in my work with faculties. Most participants in my workshops appreciate the fact that the presenter is one of them, not a salesperson or somebody long removed from the classroom. Since 2005 I have worked as an elementary mathematics curriculum coordinator, specialist and teacher coach. Working with educators to develop their math instructional practice is a great passion of mine. I am experienced in uncovering needs and interests of teachers and building on strengths to foster real growth in math teaching expertise and confidence. August, 2016. 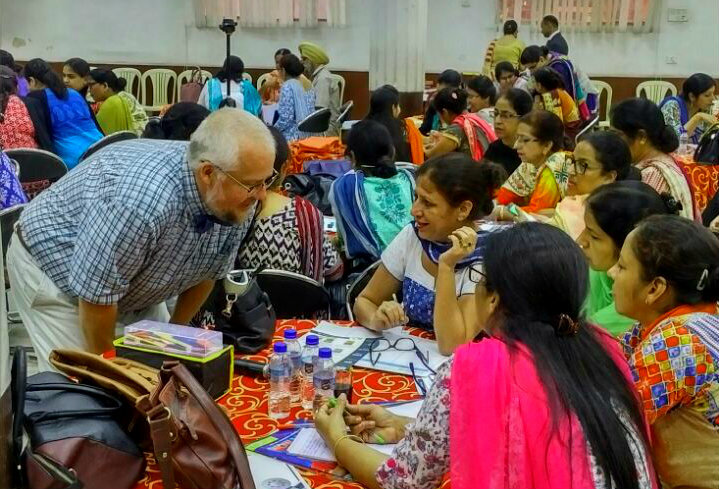 Training teachers in New Delhi, India. I carried out the first doctoral level research on Singaporean pedagogy in the United States. My doctorate, completed in 2013, has given me the unique perspective of an academic researcher on the practical question; "How do you implement the math curriculum of another culture and country into your own?". I bring my experience and academic research to bear on this question and how it is answered at individual schools.